Today at work, a guy in the lab caught a glimpse at the tattoo on my right forearm. Since I have three tattoos on my arms, it's very common for me to get asked about them, but something interesting about the tattoo on my right forearm is that it's an organic compound. Whenever scientists see it, they're always immediately interested in what compound I have tattooed on me. Anyhow, for this tattoo – it was my second – I wanted something to represent my love for chemistry and science, but I still wanted something meaningfully related to my CF. I didn't want to do some intricate design of a compound so I went ahead and got a simple organic compound that represents how a tiny amino acid has caused my disease. I enjoy it a lot because it's nerdy, much like myself. The other three tattoos I have are also symbolic, but I will talk about them in chronological order. The first one I got is a purple rose with "Dum spiro spero" written above and below it. The purple rose – and accompanying green and yellow stem – are symbolic colors. The purple symbolizes CF awareness while the green and yellow symbolize organ donation. That's also why my blog theme is purple and green. "Dum spiro spero" means "While I breathe, I hope" in Latin. It's meaningful to me because hope is such an essential part of dealing with CF; without hope, my adherence, compliance, motivation, and happiness would inevitably fade. The second and third ones I got at the same time. The second one was the phenylalanine that I discussed at the beginning and the third is a mute symbol that I got in honor of Aaron. Aaron actually got a tattoo for CF after we graduated high school (also has the quote "Dum spiro spero" on it; he was the second to get a CF tattoo). He joked afterward that he expected me to get one in honor of his auditory processing disorder. Five years later, I surprised him with this tattoo. While it's sort of a "joke" tattoo, I chose it to symbolize my love and dedication to friends and family. I have several friends that have tattoos for Lyss and I, so I thought this tattoo would be a good representation of them and for me to also not take myself too seriously. My most recent tattoo is the most meaningful and significant, though. Brah – I love you so much & very proud of you! 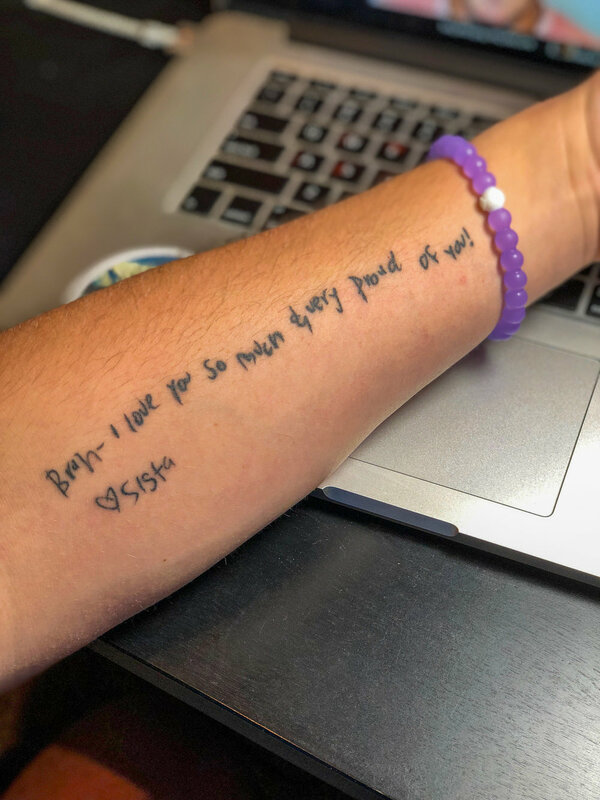 Fortunately, I was able to get that note tattooed on my forearm in her handwriting. It's a daily reminder of our relationship. I feel like she's with me everywhere I go and I feel like we're continuing this fight together. She'll forever be by my side.